Most photographers do a light screening of our potential clients, at least on social media. When these two hired me and I saw Tess wore an amazing wedding black and white wedding gown and that her hair was pink, in my mind I kept saying "please oh please let her show up with pink hair". And she did! Pink hair awesomeness aside, these two had so much chemistry and love for one another and their baby girl... it was amazing to watch them together and really just capture their beautiful relationship. I love vibrant colors, so I loved their "water" attire in neon tones. We ended by playing around with a white gown I brought and Tess was kind enough to wear it for me. I love the movement of those shots and the overall moodiness of this portion of our session displayed here. 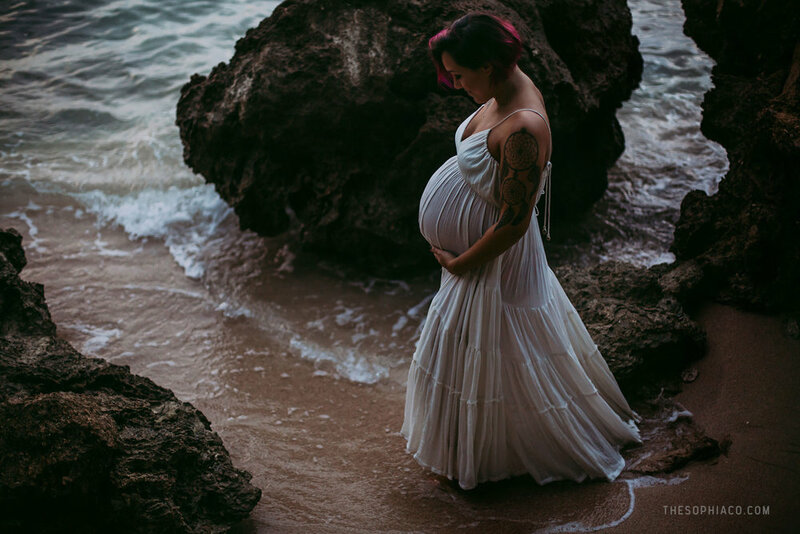 The weeks leading up to our bodies going into labor can be moody. The wait is brutal. The transition into becoming parents can also be moody. The first days as brand new parents are often moody. But there's always light and hope and vibrancy around in the midst of it all, and this shoot personified these things for me as the person behind the lens.